Come See The Worlds Only Living Gene Bank Of Seahorses! Tours are Monday through Friday. Tours are one hour in length and are lead by a professional biologist that actually takes care of over 20,000 seahorses! 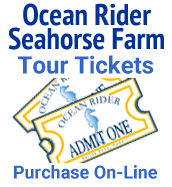 During this interactive and educational tour you will see the worlds largest living gene bank of seahorses and sea dragons from all over the world including Africa and Hawaii. From 1/4 inch pygmy seahorses to the large California and Australian pot bellies which are from 8- 12 inches as an adult. Your tour guide will wrap the seahorse tail around your finger allowing you the opportunity to hold a seahorse in a one on one personal encounter with a live seahorse. No where else in the world will you have this incredible experience. You will also learn all about the Ocean Reefs in Hawaii and what you can do to help protect this precious resource.You can call 808 329 6840 to make reservations or you can buy tickets and make reservations right here! See where we are on the Big Island of Hawaii in Kona 1 mile south of the Kona International Airport! Call ahead to schedule a guided tour!